The trail starts from the top of the gondola, and then cruises around Game Creek bowl, through pine forests and across flower-covered ski runs while gently climbing uphill. Views of the Mt of the Holy Cross are astounding. 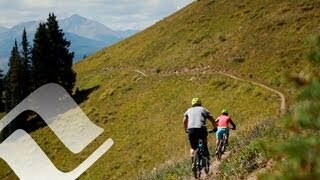 The trail then wraps around a ridge with all of Vail's back bowls laid out in front of you. A bit more gentle climbing around the bowls, mostly in open meadow, before a final short steeper climb to the top of chairlifts 4, 5, and 11. The trail ends here. Return: just returning on the same trail is certainly the most scenic, and it is an enjoyable downhill with a gentle grade, smooth, flowy singletrack, and jaw-dropping scenery. Kloser's Klimb follows a dirt road back to the top of the gondola. It's fast, but not much fun. New in 2014 is Mid Vail Escape, which will take you to Mid-Vail, and from there you could take a number of trails to the bottom, or the enjoyable Lucy's Loop back to the top of the Lionshead gondola. There are many options to make this a much longer ride. One good one is to follow the ridge along the top of Vail all the way to Outer Mongolia Bowl, from where you can catch dirt roads down to Vail Village. Check the maps for other ideas. Coming around the bend in Game Creek Bowl. Popping out of the trees on Grand Traverse.